In the fading light of a clear evening, we watch the stars appear. One by one they fill the night sky. Before long, the heavens are filled with innumerable points of ancient light. The stars appear to be grouped into patterns; the Big Dipper, Orion the Hunter, Cygnus the Swan, and more. A telescope can take us further. Craters and mountains on the Moon, Jupiter’s Great Red Spot and the rings of Saturn fill us with awe and wonder. Much more distant are the deep sky objects; star clusters, nebulae, and the galaxies. They all await you at the Kalamazoo Nature Center! The Kalamazoo Astronomical Society (KAS) invites you to witness nature’s grandest spectacle - the universe itself! From April through October the KAS welcomes the general public to join us under the stars for a night of stargazing. 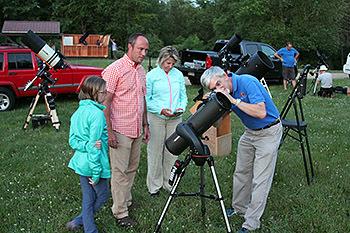 Telescopes of all shapes and sizes will be set up for your viewing pleasure near Owl Observatory, located on the grounds of the Nature Center. The observatory itself, featuring our 12" Schmidt-Cassegrain Telescope, will also be available for use. Do you have a telescope that you would like to learn how to operate or get help with setting up? KAS members will be on hand at the start of each session to give you a one on one tutorial. Learn how to properly assemble and balance your telescope, align the finderscope and computer, and choose the appropriate eyepieces. 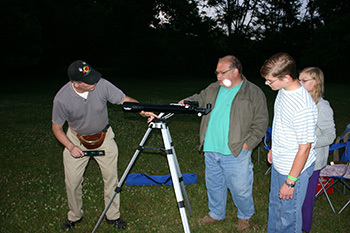 We can even help you learn how to find objects in the sky! KAS members assist guests with their telescopes. Please arrive as soon as the gates open, so we can help you set up and use your telescope before it gets too dark. Consult the schedule below for start times. Would you like to learn how to identify bright stars and major constellations? During each observing session, one of our veteran stargazers will teach participants to find those elusive patterns in the sky with a simple monthly star map, which will be provided by the KAS. 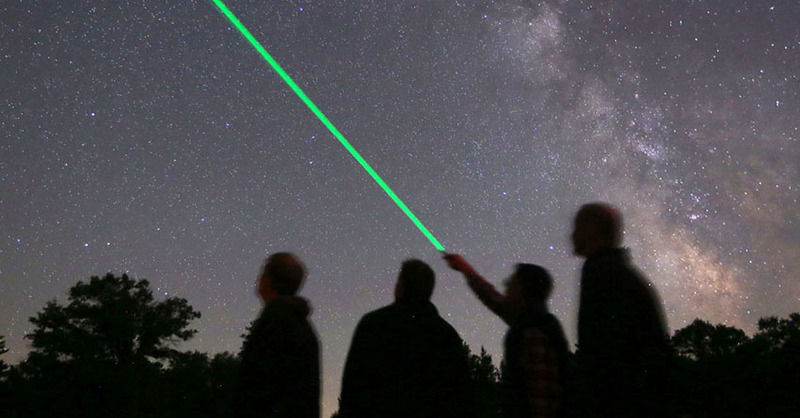 A green laser pointer that projects a visible beam into the sky will be used to trace out the constellations and asterisms. Just like at a planetarium - only under the real night sky! Visitors should bring a flashlight with RED light to use for the walk from the parking lot to the observatory and for reading star maps. This can be as simple as covering the front of a regular flashlight with several layers of red plastic. Free apps are also available for download that turn your smart phone screen RED. No white lights or automobile lights are allowed near the observing area after dusk. Use RED flashlights to preserve night vision and please keep them pointed downward! Flashlights can be purchased from Orion Telescopes & Binoculars. Exit at D Avenue (Exit 44) and travel approximately 4 miles east on D Ave to North Westnedge. Turn right on North Westnedge and go approximately one mile and turn left at the Kalamazoo Nature Center sign. Exit at US 131 North (Exit 74) and follow the above directions. Follow Park Street north through downtown Kalamazoo. Park Street will turn into Business Loop 131. Follow the sign to the right directing you to North Westnedge Avenue and the Kalamazoo Nature Center. Follow North Westnedge approximately 3 miles and turn right at the Kalamazoo Nature Center sign, just past E Avenue. Pets are not permitted on the Nature Center grounds. Smoking and alcoholic beverages are never permitted within the Kalamazoo Nature Center. Once you reach the Nature Center you'll drive past the main gate to the parking lot at the end of the long driveway. (Look for our signs to guide your way.) Only members or visitors with heavy equipment and handicap individuals are allowed to drive down the dirt service road leading to the observing field and observatory. All others must park in the main lot and walk down (north) the service road towards the observatory. This rule will be strictly enforced as space around the observing area is limited. The KAS does not charge for its Public Observing Sessions. However, the Kalamazoo Nature Center does reserve the right to collect an admission fee. They have not chosen to do so for the past several years. KAS and KNC members are always guaranteed free with their membership cards. You can view images from past sessions in the Observing Session Gallery. Moon phase data obtained from the "Sun and Moon Data for One Day" page by the U.S. Naval Observatory.